SYS Sales Director, Dirk Boehmer recently visited the Monte Carlo Yachts (MCY) manufacturing facility in Monfalcone, Italy as well as their exclusive designer, Nuvolari Lenard in Venice. Dirk shares his experience getting a behind the scenes look at the operations that produce the award-winning Monte Carlo Yachts line, a true masterpiece in Italian design. Pictured above: Daniele Caronna, Sales Director of MCY (left) with Dirk Boehmer. 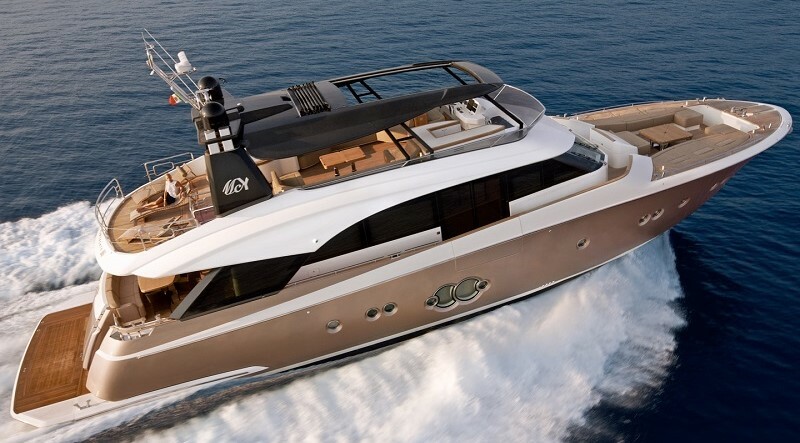 Monte Carlo Yachts manufacturers custom, luxury flybridge motor yachts from 65 to 105 feet, bringing together the excellence of Italian design, innovation and technology. MCY delivers truly unique yachts born of bespoke personal experiences and an attention to every single detail, no matter how small. "MCY uses aircraft manufacturing techniques to ensure the highest levels of product quality. Their building process is completely different from how other yacht manufacturers construct their products. This is what makes MCY stand out. Rather than building the yacht “in the hull”, MCY assembles the entire interior in a custom set of tooling, allowing for extreme tolerances and attention to detail to be realized. It would be virtually impossible to achieve the level of space utilization provided in a MCY through traditional yacht building methods. The level of engineering required just to get the tooling right would be an impossibility for many other manufacturers. The whole MCY team thinks differently than many other “old school” builders. One example that I really admire is the culture implemented by Managing Director, Fabrizio Iarrera, which is the rule of no emails! The entire executive team works in one area. If you need to communicate something, you must get up an communicate with your team members. Emails are only permitted for transmitting data and reports – not for internal communication. The company culture is very progressive and this outlook transcends through the entire MCY experience. Visiting Nuvolari Lenard was an experience that must be shared with prospects, not just by talking about it, but by doing it with them! Nuvolari Lenard is renown as one of the most creative design studios in the yacht design field and MCY has long history with the famous design house. Upon my arrival, I was greeted by Carlo Nuvolari who took me through the process of how an owner designs their MCY. The design process is really the same as on yachts over 200 feet - which they do on a regular basis. The client’s input is registered, not just what fabrics they like, but also information is received on how they actually use their vessel. This feedback is then recorded by their team, and with assistance of the client, options are rendered and the picture begins to take shape. Every client has different expectations. The Nuvolari Lenard team has established its reputation on their ability to work with different personalities to create a work of art that is of the high quality standard worthy of the Nuvolari Lenard name. MCY and our owners are extremely fortunate to develop our passions through the assistance of such a legendary group." SYS Yacht Sales is proud to offer new Monte Carlo Yachts for sale in Florida. Contact our Monte Carlo Yachts specialists for more information about building your custom Monte Carlo yacht.